If you live in an older home, a roof restoration can be a very good idea. A roof restoration can prevent interior damage and very expensive repair work. The question, of course, is when should you do your roof restoration? There are a few sure signs that a roof restoration is required, and some useful early warning signs, too. A roof restoration is a full service, complete roofing job. It may involve restoration of the interior roof, replacement of structural supports, damaged tiles, realigning of roof, resealing, and other work. The good news for home owners is that this work will pay for itself many times over, saving you the cost of repairs and the potentially serious risk of damage to your home. A visual inspection can tell you a lot about the condition of your roof. You don’t really need to be an expert, but you do need to be able to recognise possible problems. Something looks wrong: Tiles out of alignment, for example, are a certain sign that some sort of roof damage has occurred. It may be minor, but it’s best to check it out. Even in a worst-case scenario, a minor roof restoration or roof repairs will fix this problem. A group of tiles seems to be out of whack with the rest of the roof: This is definitely not a good sign, but may not necessarily be too hard to fix. 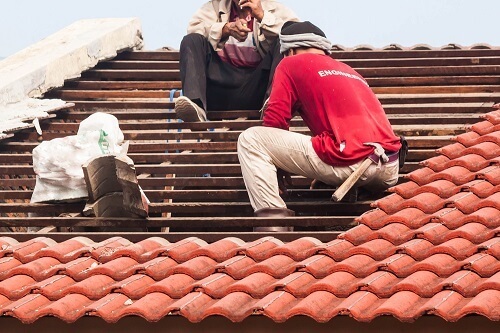 Roof restoration is fully justified in these cases if it’s a large section of tiles, or if “knock-on” damage is affecting surrounding tiles or the overall roof integrity. Debris stuck between tiles or in crevices in the roof: This simply isn’t supposed to happen at all. Most debris on roofs doesn’t stay put for long. There aren’t supposed to be any gaps or anywhere for debris to get stuck in the first place. Gaps of any kind may also mean internal roof problems. At the very least, you will require a roof inspection, and a roof restoration may well be the best option. Guttering out of alignment: Guttering problems can indicate local issues with the roof. These may or may not be serious problems. It’s a good idea to get those problems checked out, and, most importantly ensure that there are no leaks. Gaps between the roof and ceiling level: There shouldn’t be any gaps at all in these areas. Yes, you do need a roof restoration, and quickly. In these cases, there has obviously been movement of the roof. You may need a roof restoration or a roof replacement, before serious issues arise. Get on the phone right now and talk to your local roofer ASAP. If you’re looking for a roof restoration service, ReKote roofing contractors can do any restoration work you need in Wollongong and Sutherland. We can also help you with roof inspection, roof repair work, and any other services you may need. Call your local Re-Kote service on the numbers below, or fill in our online form and one of our representatives will be in contact as soon as possible.